ICANN, the international body overseeing Internet web domains, has approved web addresses in non-Latin alphabets for the first time. An Arab News editorial here; Haaretz on the subject here. Good. Most of the world writes in non-Latin scripts; it shows that the Internet Revolution really is spreading to everyone. Okay, the last couple of days' scare that a government might break out in Lebanon seems to have been at least temporarily alleviated. Pretty much all commentators from all sectarian and ethnic backgrounds now seem to agree that the outside powers are all OK on a new government, but it looks like the Christian communities are still bickering. And Sa‘d Hariri isn't ready to say when the government will happen. So, to steal Qifa Nabki's great headline, the impending anticlimax is still looming, but appears likely to loom a while longer. On that note, enjoy the weekend. For those who read (at least a little) Arabic, this is a bit of a diversion. About how the CNN Arabivc logo manages to combine the two alphabets (the dots under the CNN fill out the "Arabiyya" that starts on the right, for those who don't read Arabic...) And some other discussion. Another little linguistic aside, since I may be scarce this afternoon: have to chaperon a fourth grade halloween party. An interesting piece in The Jerusalem Post on Jewish complaints in parts of Jerusalem about the morning call to prayer from mosque speakers nearby. The complainers are from Pisgat Ze'ev and "other Jerusalem residents from Mount Scopus to Gilo." Okay. Well, anyone who has ever lived near a mosque, stayed in a hotel near a mosque, etc., expects to hear the Fajr call to prayer before dawn. It's the one call to prayer that adds the additional line Al-Salat khayr min al-nawm, "Prayer is better than sleep." It's supposed to wake you up. Now about the complaints, or I guess kvetching would be an appropriate Yiddish term. Pisgat Ze'ev is east of the Green Line, next to the suburb of Shu‘afat, and the big Shu‘afat refugee camp, not to mention the Separation Barrier. Mount Scopus, though it was technically part of Israel from 1948 to 1967, is surrounded by Arab suburbs. And Gilo is south of the Green Line, just above the West Bank towns of Bayt Jala and Bethlehem. In other words, most of these neighborhoods are in territory considered, by most of the world, "settlements" beyond the Green Line, or (in the case of Mount Scopus), surrounded by West Bank territory in the eyes of the world. Well, you know, if you choose to live beyond the Green Line for ideological or even financial reasons you might just have Arab neighbors, and their mosques must might have loudspeakers. And they were there first. "It's like we're living under their rule," Raz said, adding that the Shuafat refugee camp affected her the most. "It's the area that's closest to my home," she said. "And they just don't care." Why should they? They're in a refugee camp. What a revealing comment. You chose to live beyond the Green Line. Live with it. There is an impending sense of government possibly breaking out soon in Lebanon. It's by no means certain. Even Hizbullah is optimistic! Though their reports that General ‘Aoun (who, having lost the most in the elections, is demanding the most non-negotiable terms) has agreed to concessions would seem to be a bit premature. King ‘Abdullah of Saudi Arabia and Bashar al-Asad of Syria having met now, Lebanon can actually hope to form a government soon. Like farm animals before an earthquake, the Lebanese daily newspapers are beginning to shift anxiously ahead of what they now believe to be, yes… I think we can confirm… yes, uh huh, there’s absolutely no question this time… it’s gonna… it’s, it’s… oh my God… it’s happening! THE GOVERNMENT IS COMING, THE GOVERNMENT IS COMING! Al-Akhbar predictably claims that America’s evil Vice-Regent (Jeffrey Feltman) has given the green light, while Naharnet predictably claims that Syria’s evil Vice-Regent (Bashar al-Assad) has given the green light. Michel Aoun, in the meantime, is insisting that the light remains decidedly orange. I also like his title: "Impending Anticlimax Looming?" Kuwait's constitutional court has dismissed a complaint aimed at forcing female Parliamentarians to wear the headscarf (hijab). The complaint, brought by a "voter," argued that two of the four female MPs do not wear the hijab and therefore were not qualified to sit in Parliament. The same court last week ruled that Kuwaiti women do not need permission of a male husband or guardian to obtain a passport. It would appear that the Kuwaiti constitutional court is a friend to women's rights. Has Yemen Really Captured an Iranian Ship Taking Arms to the Houthis? For some time now, the Yemeni government has been charging that Iran is supporting the Houthi rebels in northern Yemen; Saudi Arabia and Yemen, normally at daggers drawn over many issues, have seemed to have found some common ground in their concern about foreign support for the Houthis, amid reports of Houthi clashes directly with Saudi troops in the border area. Over the past couple of days, Yemen has announced the seizure of an Iranian ship in Yemeni waters, reputedly carrying arms to the Houthis. Another account here. I have no idea if this is substantiated — Iran is denying it — but if the Yemenis have actual evidence this could have some interesting repercussions. I've already noted the tendency of some in the Sunni Arab world to portray the Yemeni conflict as a Sunni-Shi‘i one, even though Zaydis have little in common with Iran's "twelver" Shi‘ites other than both being nominally Shi‘ite, and the fact that Yemeni President Salih, who's leading the fight against the Houthis, is himself a Zaydi. But if Iran really is supporting the Houthis — up to now I've been skeptical of those charges — this could actually push the Saudis and the Yemeni government into some kind of cooperation. The purported border clashes suggest that the hammer of the Yemeni government offensive is pushing the Houthis up against the anvil of the Saudi border. Proof of Iranian involvement could drive the two traditionally rival governments much closer together. This really bears watching. Saudi Sociologist Mona AlMunajjed, "Saudi Women Today," presentation on October 20. Someday I'm going to do a big, cathartic post on Mohammed Hassanein Heikal. I've never met the man (though, oddly enough, I've met his brother), and he is always described as a confidant of Nasser, which he was or, in my personal theory, was led to believe he was. (Though he was presumably the ghost writer of The Philosophy of the Revolution, I think Nasser gave him only the information — or disinformation — he wanted him to see, and sometimes made stuff up.) I've known many people who were in meetings with Nasser, Sadat, etc., personally, who profoundly dispute Heikal's version of events, which are usually second hand. My anecdotes go back to John Badeau, Ambassador to Egypt under JFK, and come down to relatively recent times. But that's a diatribe for another day. The point is, Heikal has become a darling of Gulf media, and has been revealing online over the past few years many documents that Egypt thinks the state, and not Heikal, ought to own. At 86 years old, Heikal is not necessarily at the peak of his powers. But his 15 minutes of fame is approaching half a century. Anyway, until I have time to write more on Heikal, I must at least note his recent outpourings on the Egyptian Presidency. In an interview with Al-Masry al-Youm, he rejected Gamal Mubarak as a candidate for the Presidency and instead suggested creation of a council of state to write a new constiution. It would include key Egyptians such as ‘Amr Moussa, &Omar Suleiman, and Muhammad ElBaradei, because they would not themselves be seeking office. (In other words, he just wrote off the alternative candidates as well.) It's prompted a fair amount of debate and commetary. The interview was in two parts, for those who read Arabic. Here's Part One and here's Part Two. And the Al-Masry al-Youm website has lots of commentary on the subject: see these search results. For those who don't read Arabic, this account in Haaretz summarizes the story. Al-Masry al-Youm's English language website does not seem to have posted anything. Clearly Heikal is, on the one hand, making a proposal that has little chance of actually occurring, but on the other, rejecting Gamal and seeking to co-opt the other potential candidates by kicking them upstairs to a council of state. Even at 86, he still fancies himself a player in Egyptian politifcs: not as a candidate of course, but as a Kingmaker. Since Heikal still enjoys a high reputation in Egypt and elsewhere in the Arab world (despite my reservations noted above), I thought I should at least take note of this story. Ministerial responsibility is a concept accepted in theory in most of the Middle East, but only rarely experienced in practice. We have one of the exceptions: the Egyptian Minister of Transportation has resigned over a train wreck that (officially, so far) killed 18 and injured 36. Another account here. (But the Egyptian rumor mill puts the death toll as high as 150! Though the coffeehouse gossip is not necessarily any more reliable — or necessarily any less — than the official account, something somewhere in between may prove to be true.) Apparently (the reports are a bit vague) the resignation has been accepted. It was one of those Egyptian train wrecks that happen more often than they should: train one stops due to a water buffalo (gamusa) on the tracks; train two hits it from behind. The Minister says he's responsible but won't resign. When Gamal Mubarak does a public discussion online, he says nothing about it, and he gets criticized for it. (He's not figured out how to campaign like a real politician, but then he doesn't have to.) Something then pushes the Minister to resign. Apparently Minister Mansur is indeed out, but there's a bit of chaos at the Ministry since Ministers don't usually resign precipitously in Egypt. Apparently there's an online joke rolling around Egyptian websites that this is the first time a gamusa (water buffalo) brought down a wazir (Minister). I'll try to find a link. As the Al-Masry al-Youm link I linked to above notes, Mansur was, before becoming a Minister, head of the Mansour Group, a company with a billion-dollar turnover and, surprise, surprise, Mansur has close links with another youngish Egyptian entrepreneur, one Gamal Mubarak. I'm sure he's one of those who know him well enough to call him "Jimmy," as his friends do, and I suspect, that the fact that the National Democratic Party , the ruling party, starts its Annual Conference at the end of the week means it's not a good time to have a tragedy, especially one that generates criticism of Gamal for his silence, or his closeness to the Minister. Maybe that's why he first said he wouldn't resign, then did. Usually ministers in Egypt who need to be scapegoated are fired; this one resigned. Could the closeness to Gamal have something to do with it? And the criticism of Gamal for having an online/televised dialogue (which I didn't blog about) a few days ago and not even mentioning the train wreck have influenced the outcome? Or did the Gamal train just hit a gamusa on the tracks? This is interesting. ‘Abbas Threatens Not to Run if No Settlement Freeze? This is one of those "Huh?" developments: Fatah has said it plans to hold elections in January whether Hamas agrees or not, and now here's a report that Mahmoud ‘Abbas told President Obama that he will not run for President if Israel doesn't agree to a settlement freeze. I have no idea if this article has any basis in fact: it's hard to see why Fatah would 1) insist on elections and then 2) change horses in the middle of the stream. Who would they run instead? Marwan Barghouti is the only name that comes to mind and he's still in an Israeli jail, unless one thinks Muhammad Dahlan or someone similar has a good claim to leadershp. If ‘Abbas actually said this to Obama I think it was a bluff; if he means it, it makes little tactical sense at all. But when this story started to take on life yesterday, Marc Lynch posted his own views on the matter, (which has multiple links to other versions) and what he says deserves consideration: if it does happen it could lead to a renewal of Fatah and a revitalization of Palestinian leadership, perhaps even an end to the West Bank/Gaza division. Okay, that's the best-case scenario. Worst-case scenario? Fatah shoots itself down in flames; Hamas gains in the West Bank; Fatah falls into internecine rivalries. I'm not great admirer of Mahmoud ‘Abbas, but I don't have a say in choosing the Palestinian leadership. But a major meltdown combined with elections would make a bad situation worse. Maybe in the long run we would see improved leadership, and maybe (given the present Israeli position) the long run is all we have to hope for, but imperfect as he is, it's not a good time to step aside, in my instinctive reaction. Over at Josh Landis' Syria Comment, the go-to blog for all things Syrian, there's a rather interesting response by Syrian Ambassador to the US ‘Imad Moustapha to an article on Syria in the November issue of National Geographic. Generally I don't find National Geographic all that tendentious in their reporting, but not usually guilty of hatchet jobs. Mostly, though, I thought it was an interesting exchange; the Ambassador's coming to his country's defense is predictable, but a fight between an Embassy and National Geographic is more unusual. Those who know Syria should read both and judge for themselves. Amid all the arguments on the Goldstone Report, the furor many Israelis have towards the whole idea of questioning the Gaza campaign, etc., it's always nice to be reminded that not all Israelis are totally on board: Haaretz' Aluf Benn today asks some key questions about the war in Gaza, and why it occurred. The 63rd Middle East Institute Annual Conference is scheduled for November 9 (Banquet) and 10 (Conference). I urge everybody around DC to consider it. The registration page is here, and "the program is here. There are always last-minute changes when you're dealing with VIP presenters, so keep checking those sites. We flipped Banquet Speakers in the last few days. Why do some key Middle East policy people sometimes find they have to cancel banquet speeches to, oh, I don't know, prevent war (or wage it) or something? If you're near DC you really ought to be there. Hey, though the money doesn't immediately go to this blog (well, not only not immediately, but ever), helping MEI keeps this blog and all our other stuff going. But hey, it's always a good show. Gary Sick: "How I Got Dragged Into an Iranian Show Trial"
Last week, an Iranian-American colleague of mine, Kian Tajbaksh, was sentenced in Tehran to 15 years in prison. The indictment included the charges that (1) he was in contact with me; (2) that he was part of the Gulf/2000 network that I manage; and (3) that I am an agent of the CIA. Normally, I simply ignore silly accusations such as this. They are nothing new. On one hand, it has been intimated that I must be under the influence of Iranian intelligence (by prominent neoconservatives who believe that my views on Iran’s political development and especially its nuclear program are not sufficiently alarmist). I have also been accused (by such worthies as Hossein Shariatmadari, the ultra-radical editor of Iran’s Kayhan newspaper, who is also a representative of the supreme leader, Ayatollah Khamenei) of being a CIA agent. I regard these insinuations as badges of honor, since they merely confirm that I do not subscribe to the ideological extremes of either of these groups. I have always felt that my reputation could speak for itself and required no public defense. However, this time the accusations are really not about me but about a friend and colleague. Moreover, they are not just newspaper hyperbole by people who have an ax to grind and whose desire to make a political point exceeds their respect for the truth. These assertions are a matter of law—an official indictment by the judicial authorities of the Islamic Republic of Iran. It is often said that it is impossible to prove a negative. How do I prove that I am NOT an agent of the CIA? How do I prove that the Gulf/2000 Internet project is NOT engaged in overthrowing governments? How do I prove that Kian—a friend and a colleague—was NOT trying to lead a “velvet revolution” against the Islamic Republic of Iran? Let me simply reverse the questions. I spent 24 years in the U.S. Navy—my only connection with the U.S. government. The Navy sponsored my education at the University of Kansas. It took me to the Persian Gulf for my first exposure to the region that has become my professional specialization. It sponsored my graduate work for a Ph.D. degree at Columbia University. And it paid my salary while I was on the National Security Council staff at the time of the Iranian revolution and the hostage crisis. I never received a paycheck from any other agency of the U.S. government. Do the prosecutors in Iran have evidence to the contrary? If so, please let me know. This compels me to tell a story. (Doesn't everything? I'm Irish.) Back in 2007 we held a joint conference with the Library of Congress on the 60th Anniversary of The Middle East Journal. One of the first questions asked was introduced by a statement that many people think we're funded by the CIA. We aren't. I made my usual comment that I wasn't paid nearly enough to be working for the CIA. But then we handed out the latest issue of the Journal, our 60th Anniversary issue (Winter 2007), in which the lead article was by Tom Lippman on a 1947 CIA National Estimate on Palestine. Then veteran MEJ Editor Richard Parker (1980-86, one issue in 1995), handed out a xerox of an early article in the Journal by Kermit Roosevelt (who was, of course, with the Agency). So much for denial. The fact is if you work in DC you cross paths with lots of people. I know at least as many Arab diplomats as I do folks in the intelligence agencies, but no one accuses me of being an Arab ... oh, wait, yes sometimes they do. Having worked as both an academic and a journalist, I would have a bit of a problem with a security clearance. Have I ever associated with anyone on the terrorism list? Well, if interviews count, yeah. Enough side comments. Gary's concerns are real. An Iranian-American scholar is facing 15 years in prison for — well, something to do with the election protests and knowing Gary Sick, it sounds like. Middle Eastern scholars should be free to meet and talk with Western scholars, even those who've worked for the government. I haven't gotten into the food fight over who owns hummus yet, with Lebanon incensed that it is sometimes portrayed as an Israeli dish, but I'm glad to see that one side effect of the debate is that the Guinness record for hummus and tabbouleh has been broken in Beirut. Of course, Hizbullah is being all triumphalist about it, but maybe with a trace of previously undiscovered humor. Oh let's just settle this: who makes the best hummus? I do. Now, if you want a real debate, where did baklava come from? That fight not only brings in the Arabs and Israelis, but Greeks, Turks and Armenians too. You can't get much more intense than that. If only we could turn the entire Middle East conflict into a food fight . . . The much-publicized first Conference of the dovish Jewish lobby J Street (which drew even more attenion when Israeli Ambassador Michael Oren declined to attend) is receiving live multimedia coverage at this website. It continues through tomorrow. Egyptian opposition figure Ayman Nour's troubles with the authorities continue. Over the weekend he was allegedly attacked by security forces and National Democratic Party operatives in the Red Sea resort town of Hurghada. The linked report says he was at a restaurant with an American filmmaker, and the US may have intervened to free him. Now that he's made himself the spokesman of the Stop Gamal movement, he'll be even more of as lightning rod drawing attention from the authorities. Sorry I didn't stay up late blogging the returns from the Tunisian Presidential election, but the suspense (?) is over, and Ben ‘Ali has won another term with a mere 89.62% of the vote. Perhaps they realized that 97% to 99% is just a bit hard to believe. Bourguiba simply had himself made President for Life, saving the expense and trouble of actually running. Well, it was a deadly weekend. Sunday saw the worst bombings in Baghdad this year, destroying key ministries and leaving at least 160 dead and over 500 wounded. As elections approach, renewed violence may be predictable, but unwelcome. The tendency to declare Iraq pacified and stable may have been a bit premature. Meanwhile, weekend clashes on the Temple Mount/Haram al-Sharif in Jerusalem, while less bloody, are a worrisome escalation of tensions in the Holy City. Rumors seem to have sparked Muslim protests, but the growing tensions are real; the most intransigent elements on both sides — the settler movement and hard-core Islamists — are spoiling for a showdown. Not good. Clip is the first of eight parts. The others can be reached through it. Before I go quiet for the weekend, this may be worth noting: Yemen's campaign against Zaydi rebels in the north and increasing Saudi jitters about recent terrorist acts in the border region may be combined in this story of Saudi troops allegedly opening fire on the border area a few days back or this one claiming that Saudi troops have clashed directly with the Houthi rebels that Yemen is fighting. And here's an Arabic article in the Saudi daily Al-Watan on mutinies within the Houthi ranks. Given the fierceness of Yemen's campaign against the rebels, and the fact that while Saudi-Yemeni government tensions are decades old, the Houthis represent a greater threat in many Saudis' eyes than the government forces do, these reports could mean anything, from deepening tensions along the border itself, to Yemeni propaganda. But it merits watching, and the Houthi conflict has received little real attention outside the region. Here's an Arab News article from tomorrow entitled "Saudis Laud New Kuwaiti Law." “Kuwaiti women now have the full rights that they deserve and for which they have fought for a long time,” said Samia Al-Idrissi, a businesswoman based in the Eastern Province. “Saudi women are eligible to travel, and entitled to be responsible for themselves and the decisions that they make,” she said, adding that Saudi women are not second-class citizens. Al-Idrissi, a prominent businesswoman, believes that since women are held accountable and able to take big decisions like men, they can handle themselves when traveling. Okay. Wait. Did I miss something? Or is this subtle editorializing that this is a good thing, and let's do it here, but with a nod to the religious establishment and the mutawwa‘in at the end? Lebanon: Can't Anybody Here Figure Out How to Govern? Friday's issue of Al-Afkar magazine will have Berri's explanation for the reasons that made him abstain from naming Hariri for the second designation. Regarding re-designating Hariri, Berri said: "It is true that I work in politics, but my dignity comes first and I was the first to announce my intention to re-designate Hariri in case he apologized. Despite that, al-Mustaqbal bloc MPs started to attack me, and some of them reminded about electing me head of Parliament." Berri revealed that he asserted a lot of efforts to thwart Hariri from apologizing during the first designation and that Hariri surprised everyone by apologizing. Answering a question regarding the Progressive Socialist Party leader MP Walid Jumblat, Berri described Jumblat as the pacification and salvation partner. Marada Movement Leader MP Suleiman Franjieh said that stepping down for our country's best interest is not a loss. "No party should consider this initiative as its own victory and leave the country with the concept of having winning and losing teams," he added. "There is no preference in the portfolio that will be assigned to us as we consider PM-designate Saad Hariri has the best intentions to reach a consensus," he concluded. A really bad translation may account for some of this, but does anybody have a clue what they're talking about? Are they just spewing boilerplate? Please look at the sentences I've put in bold italics. Huh? The Syrian President Bashar Assad said that the Syrian Arab Republic is with rushing the formation of a national unity government as it will bring Lebanon back to its normal status after years of division and conflicts. After a meeting with the President of the Republic of Finland Tarja Halonen in the People's Palace in Damascus, Assad said that the importance of sticking to national legislative decisions is important to achieve peace in the Middle East. Thanks for clearing that up. Maybe it makes more sense in Finnish. 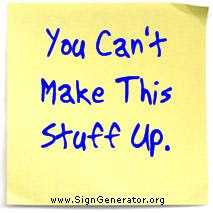 (It can't make less.) "National legislative decisions?" Meaning what? Acts of Parliament? Weren't there elections in June? Huh? There is either going to be a national unity government in Lebanon, or not, or something. Maybe. If Qifa Nabki can't figure out what's going on, I dare not try. From the leaders' quotes, I'm pretty sure they have no clue either. Sorry to sound cynical again, as I have before, I know. Poor Lebanon. Such a beautiful country. Such an educated people. Such a botch they've made of it, with the help of their neighbors to be sure, but who asked them in? The Lebanese. There are no innocents here, I fear. The US has played its role, mostly in the 1980s, and France keeps its hand in, and Israel and Syria and Saudi Arabia and Iran are, of course, all in the game. But everybody needs a Lebanese surrogate ally or it wouldn't have happened. Perhaps you can't put Humpty-Dumpty together again, but there were moments in the late 90s and early 'oos where it looked possible. Perhaps it is. It would be nice to think so, anyway. go straight to 2:40, 5:00, 7:04 to hear the language itself. (Ignore the video's ill-informed claims that this is descended from Aramaic, by the way.) If you speak Greek, there are even lessons at Hki Fi Sanna. This is far more incomprehensible to me than any mainstream Arabic dialect I've ever heard, including the Levantine Arabic from which it presumably derives - a remarkable case study in how much isolation from related varieties speeds up language differentiation. Also, if the post isn't recondite enough for you so far: While browsing around at Jabal al-Lughat I found a very interesting post called "Why would 'qaswarah' be claimed to be Ethiopic?" which makes the above discussion seem mainstream. Still, linguists among you may find it intriguing, as I did, though in fact no one can really comment who doesn't know 1) Qur'anic Arabic, 2) the Qur'anic tafsir tradition, 3) Ge'ez (Old Ethiopic), and 4) the Old South Arabian writing system. I don't qualify (okay on one and limited on two, dead no on three and four). Among personal acquaintances my count comes up to precisely one, who's now retired, and perhaps one other (yes on Old South Arabian, not sure about Ge'ez, and also retired), though worldwide there are doubtless hundreds (well, maybe dozens) who fill the bill, including Lameen Souag. Even if you aren't qualified to critique the argument, it's an interesting read. I guess I'll eventually have to mention the whole Nozette case. It seems to me, at first blush, that this is not a Pollard retread: Nozette was lured into offering to spy for Israel by a Federal agent, and there's no sign any Israeli agents were actually involved. And if he actually provided information to any foreign government, it may have been India. There is, however, an element that hasn't gotten much attention so far as I've seen. The criminal complaint against Nozette includes the information that when he was approached he expressed surprise he hadn't heard from "Mossad" (actually the FBI) earlier, becuase "I thought I was working for you already. I mean, that's what I always thought. [The foreign company] was just a front." The Foreign Company is, apparently, Israel Aerospace Industries (IAI), for which he has been working for some time. This does not seem to be much of a secret. While a government-owned defense industry, IAI is also a major defense corporation with many US connnections. In itself, it proves nothing about his handling of classified information. But the indictment clearly says there is no evidence Israel actually tried to recruit him: and of course if he was working for IAI, legally, it would be hard to determine whether he ever passed on classified information. In fact, this whole sting may have come about because it was assumed he had been passing information to IAI. At this point I don't think it rises to Pollard scales, not because Nozette is necessarily innocent, but because the degree to which Pollard compromised US and regional security has never been spelled out, but every US Administration since the Pollard case has refused any idea of clemency. Pollard, I think, profoundly undermined the security of a key US ally in the Middle East (I believe Egypt, but that's a guess), while Nozette seems to be a man playing James Bond in his spare time. But it's worth watching. Hell Freezes Over! Israel and Iran Talking About Nukes? I try not to post at midnight. After all, I'm a family guy. But sometimes it just demands it, since tomorrow morning's Mideast press appears about now. A representative of the Israel Atomic Energy Commission and a senior Iranian official met last month to discuss the chances of declaring the Middle East a nuclear-free zone, Haaretz has learned. This is the first direct meeting between official representatives of the two states since the fall of the Shah in 1979. Meirav Zafary-Odiz, director of policy and arms control for the Israel Atomic Energy Commission, and Ali Asghar Soltanieh, Iran's delegate to the International Atomic Energy Agency (IAEA), met several times over September 29 and 30 and, together with representatives of other countries, conversed, presented questions and gave replies. The popping sound you're hearing are neocon and other heads exploding. Michael Ledeen must be in great pain. If this is true — and Yossi Melman is not a tabloid headline artist — it's very interesting in the context of all the IAEA Iranian nuclear deal reportage. The exchanges between the Iranian and Israeli representatives took place within three panel sessions, each dealing with one of the issues with which the ICNND is concerned - declaring the Middle East a nuclear-free zone, preventing nuclear proliferation in the region and matters of nuclear energy for peaceful purposes. The two did not meet or shake hands outside the sessions. In one of the discussions, Soltanieh directly asked Zafary-Odiz - and eyewitnesses say he spoke in an impassioned voice, "Do you or do you not have nuclear weapons?" Zafary-Odiz smiled, but did not respond. During the meetings, Zafary-Odiz explained the Israeli policy of being willing, in principle, to discuss the Middle East as a nuclear-free zone. She also detailed Israel's unique strategic situation, saying regional security must be strengthened, security arrangements must be agreed upon and a peace agreement must be sealed before Israel would feel at liberty to discuss this topic. Soltanieh defended his country's policy, and said Iran was not striving for nuclear armament and did not endanger Israel. He said Israel did not understand the mentality and ideology of the Tehran regime. He said the regime did not oppose or hate Jews, but was merely politically opposed to Zionism. He said Iran's growing arsenal of missiles was for defensive, not offensive, purposes. If this is true, it's a game-changer, I think. I noted earlier all the Sturm und Drang about "Spy Gear" left behind by Israel in Lebanon. I had a nagging feeling it rang a bell somewhere. Now I remember why: exclusively, here's the website for "Spy Gear." My nine year old got some of this stuff for Christmas. That's why it sounded familiar. Personally, I suspect the Viper Blaster. A drunken Sudanese passenger tried to hijack an EgyptAir flight from Istanbul to Cairo using a knife from an in-flight meal. He apparently demanded to go to Jersualem and said he intended to "liberate" Jerusalem. Too much raki at the Istanbul airport? Via The Arabist, reports that Ayman Nour's office was raided during an anti-Gamal-succession meeting, and Nour's laptop and other devices seized. The anti-succession movement had been getting a fairly high profile; perhaps it was inevitable that State Security would step in. He also caught an Al-Masry al-Yaum article I missed, in which Coptic Pope Shenouda again endorses Gamal Mubarak and dismisses the Coptic candidate. The Arabist expresses dismay at the Pope's remarks, but as I noted in earlier posts on Shenouda, Shenouda tried opposition politics under Sadat and spent several years in exile in the desert after Sadat deposed him in 1981, until Mubarak brought him back. He's been a Mubarak loyalist ever since, to the dismay of many Copts abroad and some at home. Speaking of The Arabist, he posted a good dissenting comment to my recent post on Tunisia; it's worthy of your attention since it was posted nearly a week after the original post and only those who get the RSS feed of new comments will probably have seen it. Kuwait's constitutional court has ruled that Kuwaiti women may obtain passports without first securinmg permission from their husband or guardian. The court said the practice of requiring women to obtain consent "undermines her free will and compromises her humanity." Well said, and good news for Kuwaiti women. Palestinian Elections by January 24? It's hard to know where to begin here. Egypt has been pushing hard to bring to fruition the tentative agreement between Hamas and Fatah on a reconciliation agreement and new Palestinian elections in both the West Bank and Gaza. The Palestinian Authority's dubious decision to ask to defer a UN vote on the Goldstone Report torpedoed the agreement, at least from Hamas' point of view, but Egypt has been arguing that it can't wait forever and that Hamas is dragging its feet. Now Mahmoud ‘Abbas says he'll call new elections, as constitutionally required, by January 24. Is this good news or bad news? Hard to say, but if Hamas refuses, it's meaningless news. An election only in the West Bank achieves little. (Well, if Hamas won, I might amend that, but I wouldn't expect that result if the PA is running the show.) The Egyptian reconiciliation process seemed to be within sight of success until the whole Goldstone postponement thing came up, and I fear that US pressure had something to do with that. You can't have a peace process without some sort of united Palestinian negotiating team. You can't credibly negotiate borders with Israel if the West Bank and Gaza are two separate (but not truly independent) entities. Fatah and Hamas either have to work together, or there is no way to achieve both 1) and 2). Fatah and Hamas seemed to be coming close to an agreement: the Egyptians were laboring hard, and the Damascus Hamas leadership seemed more on board than the Gaza leadership, for a while, and then the whole Goldstone debacle blew it out of the water. Egypt is clearly leaning on Hamas, but that can cut both ways. Does any of this matter if Netanyahu doesn't have a massive road-to-Damascus conversion? I'm still not sure if an arbitrary January 24 deadline is a good or bad augury. Now Arab League Secretary General ‘Amr Moussa is not ruling himself out of the race for the Presidency in Egypt. (For those who read Arabic, here's the original interview in Al-Shuruq that Reuters is quoting.) Though at 73 he is not a young man, he does have an Arab world reputation and long served as Egypt's Foreign Minister. What I think is worth noting is that there has been a sea change in the willingness of the Egyptian media (the independent press anyway) to discuss the succession question and report on the various anybody-but-Gamal efforts (though Moussa clearly indicates Gamal has a chance too — well, as clearly as a diplomat who has to speak for the whole Arab League is ever allowed to be, anyway). 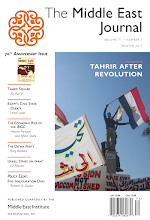 In part I think the discussion of alternatives to Gamal — the Baradei, ‘Omar Suleiman, and now ‘Amr Moussa discussions — represent a real assumption that Husni Mubarak will step down, and perhaps also an assumption on many people's part that we may not have two more years before something happens. There have been rumors of an early Presidential election sometime in 2010 for some time now. The discussion — which would have been taboo a couple of years ago — shows that there really is a fin du règne sense out there. Prof. Mishkat Al-Moumin, an MEI Adjunct Scholar and professor of Environmental Science and Policy at George Mason, has launched a blog, True Stories About Security, telling stories about her memories of Iraq. Former MEI President, and former Assistant Secretary of State for Near East Affairs and Ambassador to Israel, Egypt and the UAE Edward (Ned) Walker is now tweeting on Twitter @AmbassadorNed. Kuwait: Consolidate to a Single Electoral Constituency? This story could be, if it actually happens, extremely important. A committee of the Kuwaiti Parliament has approved a move towards creating a single electoral constituency. Currently there are five constituencies, and critics say the system is gerrymandered to support pro-government/tribal political blocs. As the article itself notes, earlier versions have had anywhere from 10 to 25 constituencies. As far as I can think of off the top of my head, the only Middle Eastern electoral system that has a national-level constituency with no geographic districts is, well, Israel. Worth watching, though of course little may actually come of it. Building off of yesterday's post on Hizballah and Israel, I need to tell you that the UN in southern Lebanon is complaining the Israelis have placed "spy gear" in southern Lebanon that is now causing suspicious explosions. The only thing cooler than spy gear, I say, is exploding spy gear. What, though, is "spy gear"? Can you imagine the UNIFIL investigation? What did you find, Pierre? Looks like a case of spy gear, Jim. I understand his somewhat cynical approach here since so far this seems to be blown way out of proportion, given the fact that sensors and information gathering equipment are the tools of the trade in the security business these days. Hell, clear back in the 50s we tapped the East German phone system without realizing that the East Germans knew all about our secret tunnel and were taking advantage of that knowledge. It's COMINT, folks. Once again, the Islamic Resistance in Lebanon thwarts an Israeli plot against the country and its people and uncovers a non-traditional violation of the Lebanese sovereignty under the form of "espionage." In a statement it released at pre-dawn, Hezbollah hailed the "major accomplishment" achieved by the Islamic Resistance when its members "uncovered and thwarted an Israeli enemy aggression," a reference to three Israeli spy devices that have been blown up in south Lebanon over the weekend. Hezbollah pointed out that the Islamic Resistance members "managed to uncover a spy device planted by Israel between Houla and Mais el-Jabal in South Lebanon that had been installed following the July 2006 war." It said the device was booby-trapped. "The spying gear was planted on a telecommunication cable that was placed after the 2006 July war. Right after the device was discovered, the"Israeli enemy remotely destroyed the gear," the statement read. Okay. I read that as they tapped one of your telecom lines, or something similar. The statement is, well, over the top, but hey, it's Hizbullah. As for the Israeli tap: Well, who wouldn't? Though since then Hizbullah has suggested this was planted after the 2006 war (so Israelis can infiltrate the south despite Hizbullah's security? I'm shocked, shocked.). And Israel, of course, is trying to turn the alleged revelations against Hizbullah. I'm not sure this is news. It's classic shadow war stuff, but it distracts both sides from any substantive discussion of issues. Sure each side spies on the other. Israel has some technical capabilities that may have been in play here, but it's still not clear from the stories that this is anything more than a tapped communications line in which the tapping devices were wired for self-destruct, perhaps remotely. Israel had recently accused Hizbullah of being behind a munitions explosion in the area. Hey, everybody, it's even easier to listen to your cell phone calls, you know? This story might last a few more days, but it doesn't strike me as very shocking. Overnight: Another Saudi Terrorist Incident? This from the early overnights: it's not entirely clear yet but this story in the Saudi paper al-Watan of the arrest of a a man who opened fire on the police, (sorry: Arabic only; I'll try to post an English version later), apparently from a car, opened fire on a police patrol in the ‘Asir region (again, in southwestern Saudi Arabia near the Yemen border, where so many recent incidents have occurred), looks like it might be yet another terror incident. More as the day progresses and the news arrives. From The Jerusalem Post (of all places) an interesting detailed article (there are two pages to the article) on some impending transfers and promotions in the Israel Defense Forces that may have a major impact on some little-reported links between IDF officers in the West Bank and the Palestinian Authority. A useful read. Muslim Brotherhood Guide "Has Not Resigned"
UPDATE: A bit more background here. Perhaps this is another Streisand Effect post like the previous one, but the General Guide of the Muslim Brotherhood, Mehdi ‘Akef, has not resigned! (English version of the denial here.) Now, earlier postings have noted that ‘Akef reportedly plans to step down in the near term, but he hasn't resigned yet. There have been some interesting developments lately in the Egyptian Muslim Brotherhood, and these rumors may stem from them: the Brotherhood will, apparently, have an option to appeal some decisions of military tribunals to civilian courts, and there is talk of the next General Guide being a younger figure from the group's reform movement. Right now I'm not sure what these rumors stem from or what they mean, but they're worth watching. Something is going on. King Mohammed VI and the "Streisand Effect"
We seem to have a classic case in Morocco. The government has shut down a weekly publication and jailed its editor for publishing an article about the King's health. I had never heard of the publication in question, or any recent rumors about the King's health, but now everybody from Reporters without Borders to the Committee to Protect Journalists to probably everybody else is criticizing the crackdown on the publication, and I find myself (as you doubtless will) wondering what's wrong with the King's health. Yes, I get the whole concept of lèse majesté, that you just aren't supposed to talk about Kings (there was an earlier case where a paper was prosecuted for actually running a complimentary article that was considered to intrude on the King's privacy). But closing a publication and jailing the editor makes those of us outside the Kingdom more curious about the King's health. And since as far as a reasonable amount of Googling tells me, it's just that he's got a rotavirus, I don't get the big deal. I've had that. Is royal diarrhea the big offense, or is there something else going on here? See, you made me wonder. And I would never have heard this rumor if you hadn't cracked down on an editor. Now, of course, those of you who follow this stuff may be aware that the King, back when he was Crown Prince, got some unfortunate European tabloid coverage that created some scandal, but I have no intention of resurrecting that. I'm just noting that if you don't want people speculating, stop shooting the messenger. More people are talking about his health right now than if the article had simply been ignored. Egyptian blogger Zenobia has the picture of the day: the first evidence that Husni Mubarak, a mere lad of 81, is starting to gray at the temples! I think it's just a trick of the lighting, or else he left the shoe polish at home. See here to compare Mubarak's hair coloring with Barack Obama's (maybe he figured a little gray in the temples would make him more like Obama?) or here with Bob Gates. As I've suggested before, this may just be sour grapes on my part: I'm 20 years younger than he is, and completely white haired. I missed this story, which is now a week old, but I'm pretty sure that two phrases I do not like hearing together are "Al-Qa‘ida in the Islamic Maghreb" and "Large Hadron Collider." The suspect had been working on the LHC Beauty (LHCb) experiment, which is investigating the slight differences between matter and anti-matter by studying a type of particle called the "beauty quark". Don't you just love it when they play with matter and anti-matter? 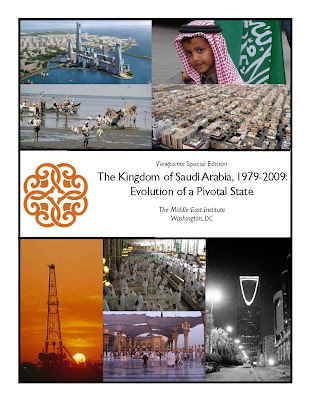 MEI's continuing series of Viewpoints Publications centering on the 30th anniversary of key events of 1979 has produced the fifth of six scheduled publications this year: The Kingdom of Saudi Arabia 1979-2009: Evolution of a Pivotal State. The 21 essays by 22 contributors are issued to mark the 30th anniversary of the seizure of the Mosque in Mecca, but the essays are not limited to that event but deal with many aspects of Saudi society. The link above takes you to a summary; the full publication (.pdf) is here. Lots of reading here, and the price is right (free), so enjoy. Okay, we old Boomers who remember the sixties are glad to see student agitators still exist, but something seems a tad different somehow. Cases in point: a) the other day, Kuwait University's student elections saw a solid victory for the Islamist movement, while the Al-Wasat al-Dimuqrati group ("The Democratic Center") ran well behind; b) while in Egypt, women and other protestors at Cairo University have staged a sit-in over the recent ban on the niqab or full face veil in classrooms. Oh, come on, at least call it a veil-in or something. The Egyptian opposition doesn't unite very often, but Wednesday evening a wide range of Egyptian opposition groups, from Ayman Nour to the Muslim Brotherhood to the Kifaya Movement, came together to protest the tawrith or inheritance of power by Gamal Mubarak. The rally is getting publicity not only in Egypt but elsewhere, and of course there was the recent flutter of talk about Muhammad El Baradei (getting a bit of mileage from a Saudi paper here) the curious flurries earlier this year in favor of ‘Omar Suleiman, and even the country's first Coptic candidate. It seems like an "Anybody but Gamal" ground swell, if you forget for a moment that in Egypt's variant of one-man-one-vote, Husni Mubarak is the man, and he's got the vote. I really don't think the average Egyptian likes the idea of inheritance — tawrith is the word constantly used by the opposition, since it implies something handed down as in a will, the Presidency as a "bequest" — but I also fear the average Egyptian is inured to the fact that he or she doesn't really have a say in choosing the next Pharaoh President. The traditions of Pharaonic power have been adapted and adjusted through the millennia, but it's still a pretty Pharaonic presidency. Because Egypt really does have a certain degree of freedom of expression not found in some other Arab autocracies, and a relatively independent press alongside the government one, the opposition can hold these sorts of rallies (up to a point), and make itself heard (in central Cairo), and find support from bloggers. That's the pressure valve that keeps the system from exploding. But Gamal does have some real support from the nouveaux riches entrepreneurial class, and he has put his own brand on the National Democratic Party. Lately pro-Gamal Facebook groups are proliferating, I hear; I'll link to some when I have time to chase them down. I haven't got any trace of monarchist tendencies (I'm a blend of Irish ancestors who hated British Kings and Scotch-Irish backwoodsmen who threw out the last one around these here parts), but I confess there have been moments I find Gamal a bit more impressive than Mubarak Senior. Not that that qualifies him for the Presidency. I think the big question mark for Gamal is the Army and the Security Services. He isn't one of them. And however much Sadat and Mubarak have co-opted the Army by granting it its own sector of the Egyptian economy, Gamal would still be the first President of Egypt not to come from the military. (And go back and look at the official portraits of Kings Fuad and Farouq: they're always shown wearing military uniforms.) If he does succeed, he's going to need either Field Marshal Tantawi or ‘Omar Suleiman (or preferably both) standing next to him when he's sworn in. A few years ago there was talk that Gamal would launch his own party. (It was rumored to be called Mustaqbal: the Future. Of course Hariri in Lebanon appropriated that, but I've sometimes wondered if Ayman Nour named is party al-Ghad (tomorrow) in imitation, and that's why the Mubaraks have come down so hard on Nour.) Instead he took over the National Democratic Party. But he seems to be (if the opposition types are right in their criticisms) depending on a very small clique of close associates. 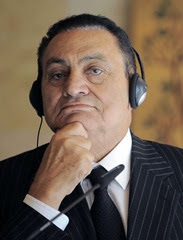 I still think the unpredictable element is Husni Mubarak's health. If he doesn't serve out his term, the succession process could be disrupted. He's actually been very slow and systematic: a lot of us thought Gamal would be General Secretary of the Party by now, but he's only head of its Political Committee (admittedly, that's just a more palatable translation of what a few decades back would have been translated "Politburo"). But as inexorable as the process seems, it isn't quite there yet, and if Husni left the scene suddenly, I'm not sure the process would proceed. One additional side note: a theme you'll see in some of the linked articles is that a) succession is the kind of thing that happens in places like Syria, and b) Egypt is not Syria. The Asad succession has long been pointed to by Egyptians as a sign that Syria's not really serious about its republican credentials, and there are lingering resentments of the 1958-61 United Arab Republic, when Syria and Egypt learned to resent each other during three years as one country. Until fairly recently, Egyptians denied that Gamal would ever succeed. Now, they seem to be more resigned to the possibility. But we're still about two years out from the elections, and much can happen between now and then. A fairly lengthy piece in Haaretz on Israeli Ambassador Michael Oren's giving up his American citizenship and the Embassy's decision to snub J Street, the new dovish Israeli lobbying group seeking to offer a different approach than AIPAC. Some of us remember when Yitzhak Rabin (privately, though it promptly leaked) accused AIPAC of essentially representing Likud. Now that Likud is back in power, J Street is ignored by Israel's Embassy. A reminder that 1) not all Israelis are a cheering section for the present government and 2) Haaretz can write things that the Washington Post would be lambasted for. I like Tunisia. It's a lovely country. I've visited many times, and my wife and I honeymooned in Sidi Bou Said in 1993. It's prosperous by Arab world (non-oil) standards, cosmopolitan, secular, Mediterranean. North African cuisine is great: I like couscous, I like the fiery red harissa, I even like the merguez sausages cooked at the little stand-up snack bars, since they give the Lipitor something of a challenge. It's the Maghreb country I know best (I emphasize Maghreb, not "North African," since that would include Egypt). I don't usually name-drop much here, but to set the stage let me note that I've even met President Zine El ‘Abidine Ben ‘Ali a few times and once had a one-on-one (no one else in the room) hour long off the record interview with him. The former Foreign Minister and longtime Ambassador to the US, Habib Benyahia, was an old friend, as is the current head of the Tunisian External Communications Agency, Oussama Romdhani, another Georgetown product like myself. I do not, however, mistake the political system for a democracy. Redissi's article notes the limitations on pluralism. I would note a few others. Some US and French journalists visit Tunisia and are awed by the Western (mainly French) feel of the cities, the secularism and prominence of women, the downright pride in the country's Jewish heritage and the ancient Ghriba synagogue on Djerba Island, the fierce anti-terrorist sentiments, and (though not always mentioned in their reports), the beach resorts full of German and Italian tourists in rather scanty bathing suits for an Arab country, the ready availability of alcohol (we are talking about journalists), and they feel they have found a real Western island in the Arab world. That they have, but not in a political sense. Tunisia has never had a particularly strong military, and the military has never played a role in politics: that is one legacy of the founder of the state, Habib Bourguiba. But Ben ‘Ali, who deposed Bourguiba in 1987 when the old man was officially 84 (some say older: he lived to be 97, but perhaps more than 100), came from the internal security apparatus, so while he is only peripherally a military man he is primarily an internal security type. Bourguiba was, unquestionably, increasingly a loose cannon. By the time he entered his 80s he had first cultivated his son as his successor (long before the Asads, Saddams, Mubaraks and Qadhafis) but then split with said son; more and more he seemed to be senile (yes, I know it's not a medical diagnosis), and finally his Prime Minister (Ben ‘Ali) deposed him. Bourguiba had been President for Life. Ben ‘Ali promptly announced that there would be no future Presidents for life, and amended the constitution to limit the President's terms, and the maximum age the President might run for office. (As Ben ‘Ali aged and served more terms, these limitations were lifted.) Ben ‘Ali keeps extending his eligibility, but he is not President for life. Since 1999 he has run against competing candidates. In 1999 he squeaked through with 99.66% of the vote; in 2004 he was clearly less popular, only winning 94.48% of the vote. I'm going to go way out on a limb here and guess he's going to be reelected this year. Without a runoff. Why do we hear less about Tunisian lack of democracy than about other countries? Partly because the Tunisian press and opposition parties are rather tame. The press tends to be pro-government or government run, and the opposition party papers are dependent on the government for printing plants, paper and ink. There is nothing comparable to the sometimes wild tabloid media that exists in Egypt, which is otherwise not particularly more liberal in electoral politics. And Tunisia knows how to cultivate and flatter Western journalists (yes, including me) for good press. And it's no Iraq under Saddam, of course, though it's also not terribly hospitable to strong oppositional politics or political Islam. Tunisia is in some ways something like a North African Singapore: economic prosperity and high employment compensate for an absence of political freedoms. (And increasingly, China is a sort of Singapore writ large.) Most of Ben ‘Ali's initial efforts after he displaced Bourguiba have been countermanded: the term limits, the age limit. But the economy has been liberalized from the rigid statism of Bourguiba's day. And the opposition parties, at least the approved ones (no Islamist parties need apply) are guaranteed seats in Parliament, though the ruling Constitutional Democratic Rally (the modern incarnation of Bourguiba's Neo-Destour) is guaranteed a constitutionally-amending lock on the majority. Despite some opening up, Ben ‘Ali has also gone from the somewhat austere reformer to a President in the usual Arab tradition: his (second, acquired after becoming President) wife and her family have enormous business and financial power, and her jet-setting to the fashion spots of Europe has drawn European tabloid attention (who often refer to her as a "former hairdresser"). Of course, I never descend to such tabloid gossip here. So the campaign is on. There are four candidates. Usually one or two of them will endorse Ben ‘Ali somewhere in the campaign and announce their campaign is only symbolic out of their love of democracy (?). There was more suspense in the Algerian election, if you don't mind my saying so. Bouteflika only got 90%. Yet, I still like Tunisia. Al-Riyadh on Lebanon Returning to Syria? Oh, my. This could set off some real paranoia in some Lebanese circles, coming as it does after the ‘Abdullah-Asad summit: Al-Riyadh, the Saudi newspaper, is asking "Why Doesn't Lebanon Return to Syria?" It's in Arabic so some of you can't read it, but it will get attention, I suspect, in the Lebanese press. Yes, the opening lines are, "I realize it's not an easy manner, and the difficulties are not exclusively Lebanese ..." You got that right. Sorry I'm not so attuned to Al-Riyadh as to be able to pick up on any nuances here. But the Lebanese are going to be reading this one carefully. UPDATE: See the links in the first comment below. Abu Muqawama has a useful thought this afternoon on using the extended debate over Afghanistan to put pressure on Karzai. That's an oversimplification, so read the whole thing. Turkey and Armenia held their soccer game today, and despite some concerns about Azeri flags and other such issues, it seems to have gone off all right, but there are protests in Yerevan over concessions to the Turks (and as I noted earlier, Armenian American groups aren't happy either). First, reportedly as a protest against the war in Gaza early this year, Turkey objected to Israeli participation in a joint NATO air exercise, which in turn led to the US and Italy pulling out of the exercise, and the US "gently" criticizing Turkey for the decision. Israel sought to play the issue down, with Haaretz reporting that "diplomats" at Israel's mission in Ankara were emphasizing that "Israel has no interest in settling disagreements through newspaper headlines." But the newspaper headlines were quick to note that even while feuding with Israel, Turkey was cementing its relations with Syria, which were hostile not so long ago, with some of the most solid indications of cooperation yet. The Turkish Foreign Minister took a good part of the Turkish Cabinet to Aleppo to forge a new cooperation council with Syria. They announced the lifting of visa requirements between the two nations, a move previously announced but now apparently formalized. 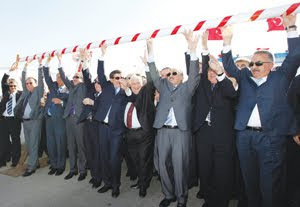 But it wasn't just the Foreign Ministers: along for the trip were the Turkish Defense, Interior, Economy, Oil, Electricity, Agriculture, and Health Ministers. And here they are celebrating the Aleppo meeting. Apparently sunglasses were de rigeur, though I think the white-haired chap in the middle is Syrian Foreign Minister Walid Mu‘allem, and he's not wearing them. And, as if to rub salt into the Israeli wounds, Turkey and Syria announced that they will hold a larger joint military exercise than the first, limited land exercise they held last spring. This announcement, on the heels of the cancellation of Israel's participation in the NATO exercise, was hardly coincidental. Anyway, it is obvious from the press coverage, at least outside of Israel, that the Syrian rapprochement and the Israeli estrangement are being reported in tandem, as if reciprocal in some way. That could be unfortunate because, while better relations between Ankara and Damascus have been a priority for the Erdogan government for some time, that improving climate has also made Turkey a useful intermediary between Syria and Israel, and an interlocutor in the efforts to resume negotiations on the Syrian track. But, of course, the Netanyahu government insists it's not going to negotiate over the Golan (or at least isn't going to agree to resume negotiations where they left off back in the 1990s), and that makes progress pretty difficult. Turkey may be sending a number of messages here. Certainly it has sent one clearly to Israel. The message to Syria also seems to be that the old disputes over the PKK and water rights are forgotten or at least set aside for the time being. I may have added little new here, but if you haven't been following this the links above should bring you up to date. Lebanon: Back to a National Unity Government? Defector from Iranian Nuclear Program?